Back in 1967 Walt Smith of California went to work building guitars. He knew John and Rudy Dopyera and learned how they made Dobro guitars. Later he learned a lot about building guitars from Semie Mosley when Mosley started building Mosrite guitars. He was living in Ojah California at the time. Interestingly, Walt Smith was encouraged in his effort by his friend Leo Fender. 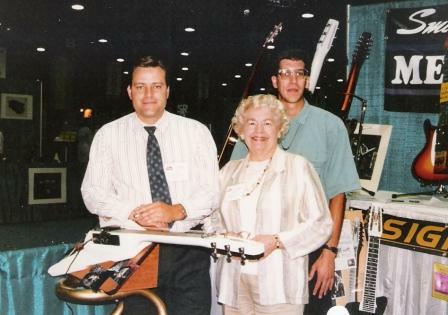 As we know Mr. Fender started out building steel guitars and was a big encouragement to Walt. He then returned to his hometown and started building his own brand of unique steel guitars. He named them Melobar guitars. The first instruments were wooden student models with positions engraved on the fretboard. Smith built a metal version of this guitar. However he was unhappy with the completed instrument. He kept some of them and had his son take the rest to the county dump. Many of these guitars were salvaged by dumpster divers. This guitar has been unofficially designated as the Melobar Dumpster Guitar. His son, Ted Smith, mentions in a reply that his father was furious with him until his passing in 1988. 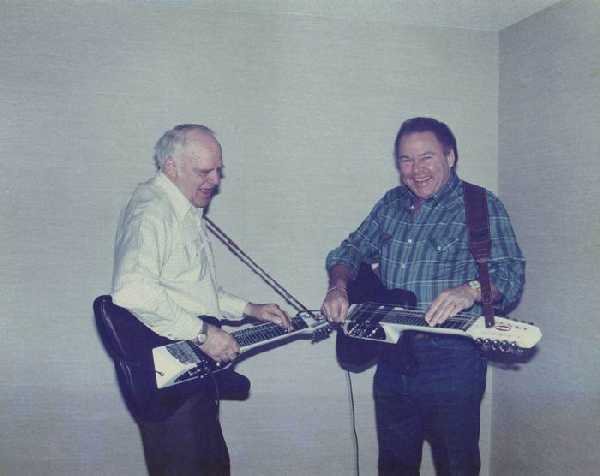 Walt's claim to fame were the electric steel guitars he made, which were meant to be played like Dobros; standing up. These were solid body guitars made so the boday tilted at a 45° angle from the neck. Because Melobar guitars were all handmade there are subsequently few. Probably around 1,000. Not only are they unique, but rare as well. Many well-known steel players have a Melobar in their collection. 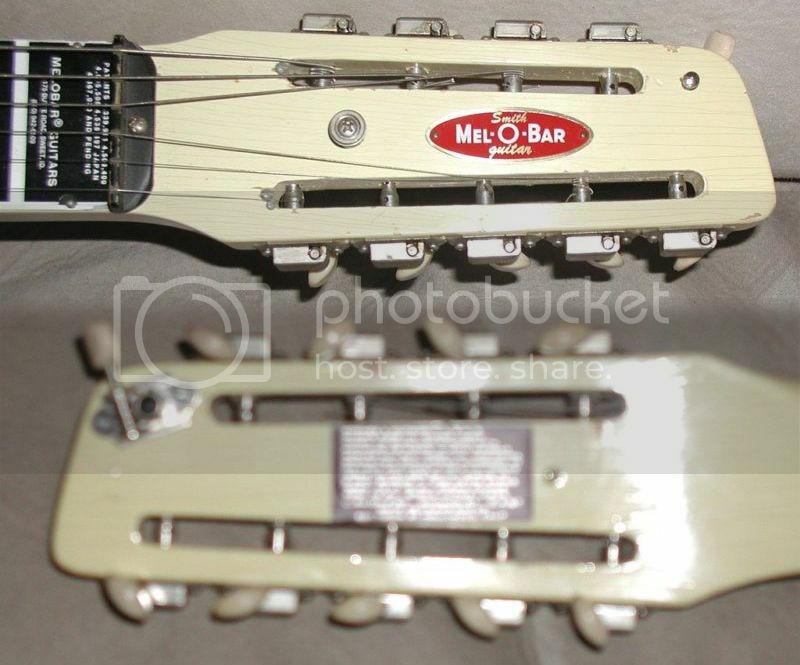 Players such as David Lindley, Rusty Young, and my favorite steel player, Cindy Cashdollar all own a Melobar. As his family got older, Walt instructed his children and grandchildren in the craft of luthery. Walt renamed his venture The Smith Family Music Company. At first Melobar Guitars started with six string lap steels. The product line soon expanded to include not just six string instrument, but eight string guitars as well. 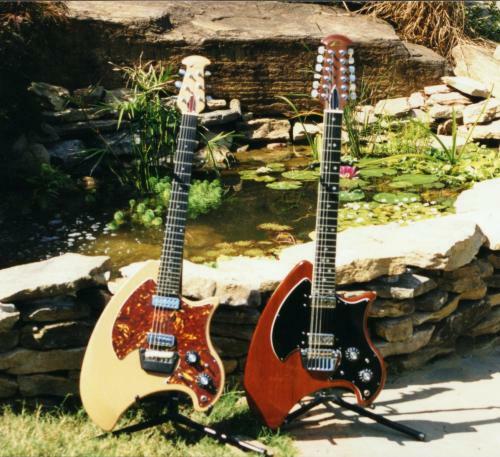 By 1991, after Walt's death, Ted Smith had taken the company reigns 1996 and introduced the Rattler six string guitar and the Tomahawk eight string. The Rattler was built as an entry-level instrument. These were both sit-down lap instruments. 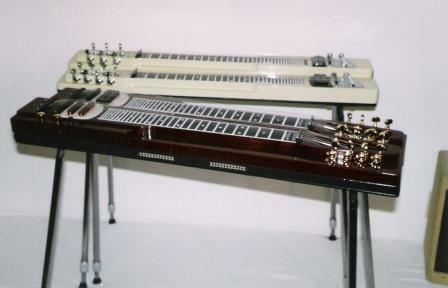 Another instrument developed that same year was the Supersteel, that came with interchangeable double and triple neck stands. 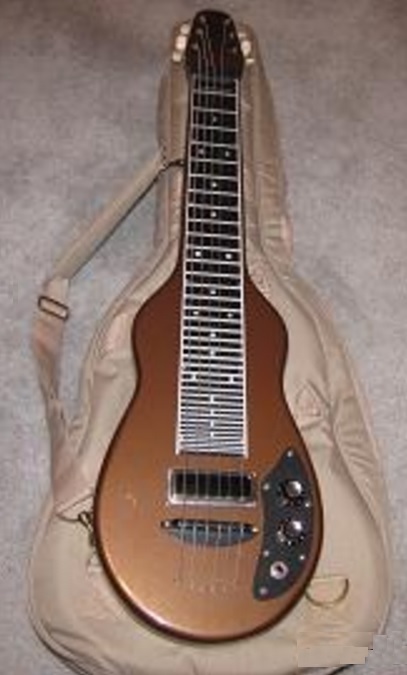 In 1998, Melobar added a Fiberglass resonator guitar to the line-up. 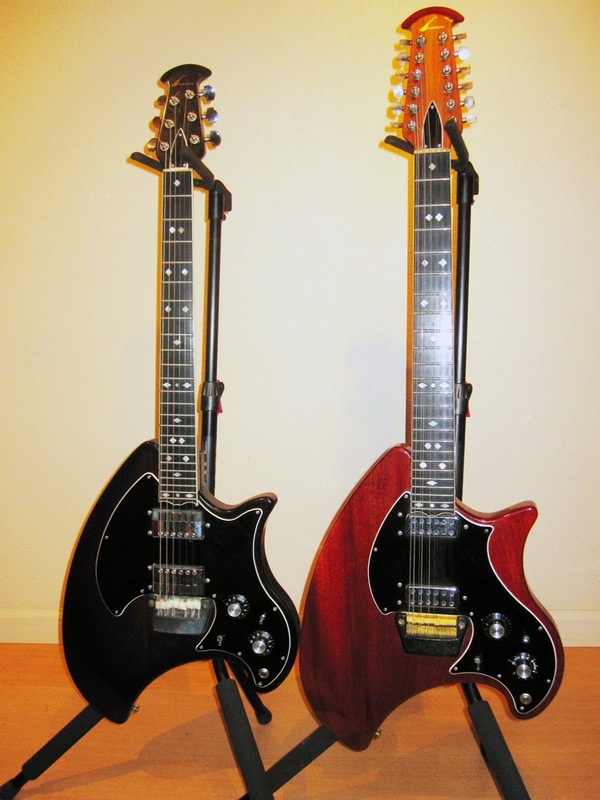 These models were produced in six, seven, and eight string versions. 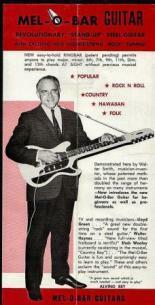 That same year Melobar/Smith Family Music add a double neck instrument called the Tele Steel Guitar. 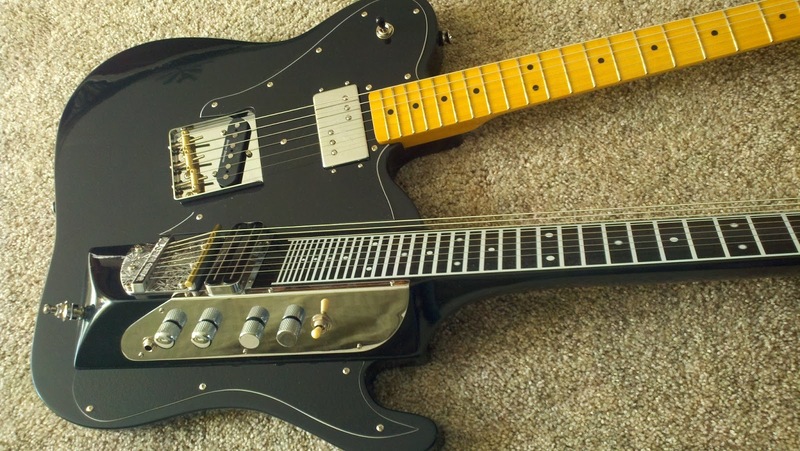 The Tele Steel Guitar is reminiscent of Junior Brown’s Guit-Steel. The top neck is a guitar neck and the bottom-angled neck is a 10-string steel guitar. Walt Smith had a preference for 10 string guitars. Possibly the most well known Melobar was the Skreemer. This is the one with a Flying Vee shape and an angled neck, designed to be played standing up. It was offered in a six or seven string version. 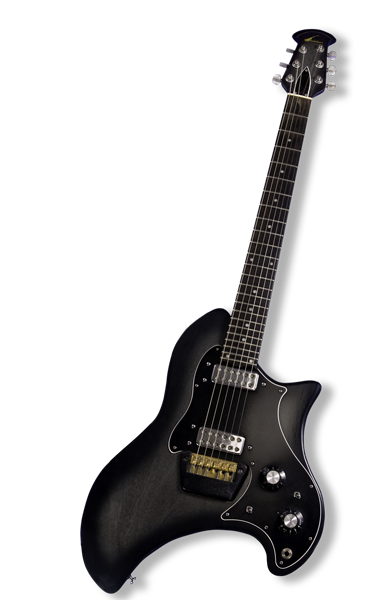 The Melobar X-10 is a 10-string Explorer shaped guitar that is made to be played in a standing position. 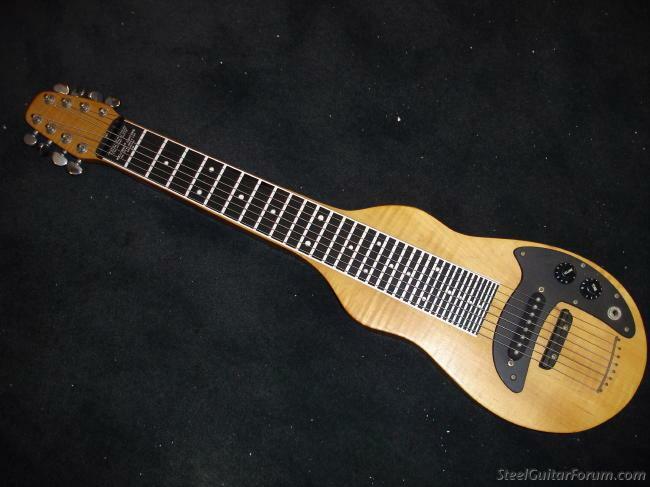 The Melobar Powerslide was indeed a unique guitar. It came with 10 strings and was shaped like a Gibson Explorer, but the body was soft. 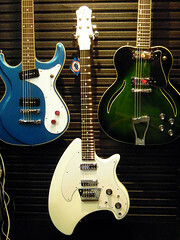 Smith Family Music made a Mosrite Melobar model that came in sunburst or white. This guitar was based on the Ventures guitar. Walt Smith died in 1991. His wife, Mildred Smith, and son Ted Smith kept the company going. They built over 1000 instruments, including lap steels and Melobars. A family business is a tough to run. I know since I ran one for 27 years. Profit is hard to come by. Good employees are hard to come by and great ones even harder. Mildred Smith passed away, so it was up to Ted and his son Marc to seek some financial backing. Jim Frost of Black Canyon Guitars and an investment group from Sweet, Idaho became backers of Melobar. However, it may have been too late. The factory they were leasing did not renew their lease. This forced the new owners to close up shop. I have read that Jim Frost and Ted Smith attempted to resurrect Melobar in 2008 with a company called Hardway Manufacturing. Ted Smith has entered into the world of sales and is promoting a book he has written about cold calling. Melobar/Smith Family Music is no longer in business. But for a while they produced a truly unique and unusual guitar. Update! ere is a wonderful link that I have come across from Ted Smith. 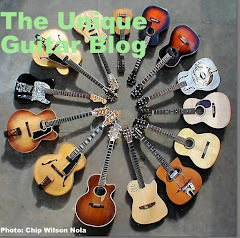 In 1967 I recall seeing THE original Ovation roundback guitar number 006 at the Chicago NAMM show. 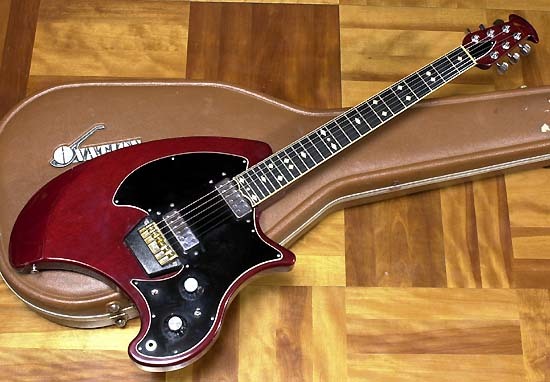 This guitar was actually built in 1966 by Kaman engineers. As I recall it was very plain instrument. This was in the days when Kaman Company was just starting into the guitar business. The story goes that Charles Kaman had attempted to purchase Martin. When Fred Martin refused, Kaman started his own guitar to manufacture his own guitars. 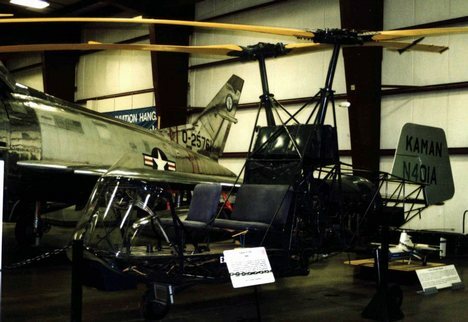 At the time the companies main product was and still is helicopter parts and equipment that needed precise engineering. Charles Kaman (pronounced like Command without the D on the end) played guitar and had an old Martin hanging in his office. He saw the Martin as being a great instrument, but very delicate and prone to changes in the temperature and humidity. 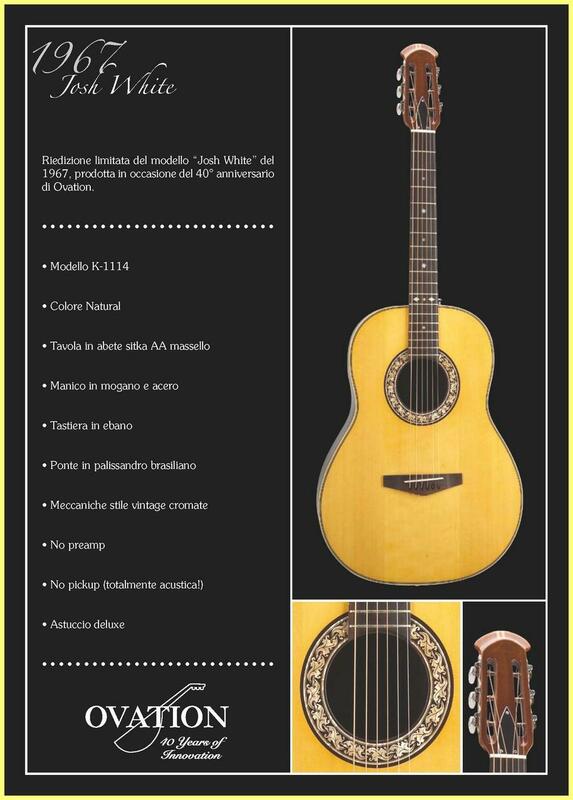 Kaman’s goal was to create a guitar with the Martin’s tonal qualities that was durable. By utilizing the same material that was used to build helicopter bodies, he fashioned a parabolic bowl to be used as the guitars back. He believed this would help to project the guitar’s sound. As a plus the back needed no bracing. Skipping forward to 1972. Ovation guitars were by now part of the mainstream guitar market thanks to an array of artists that were using Ovations guitars. 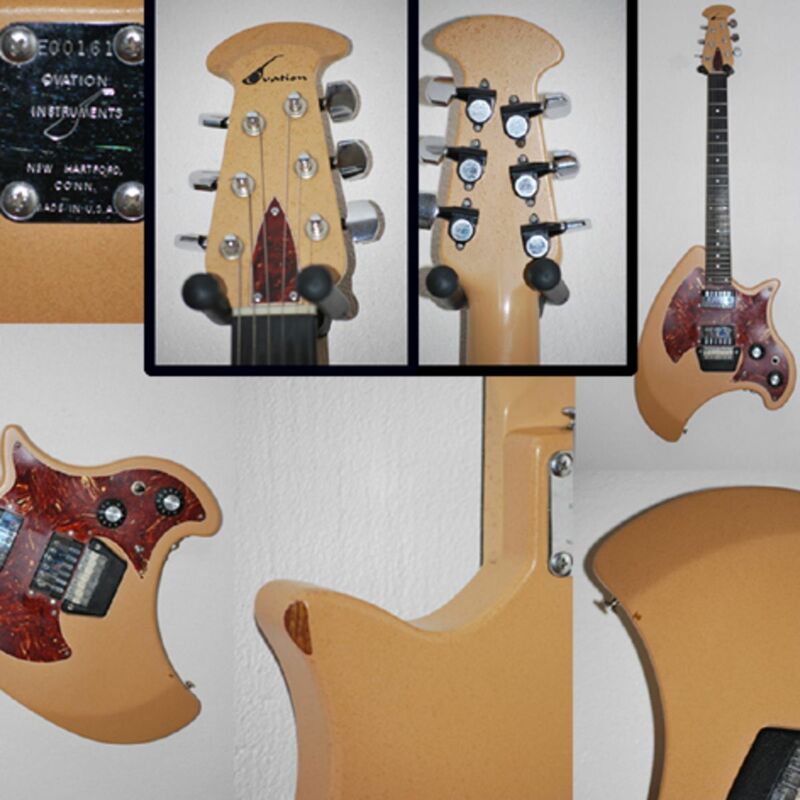 Ovation’s designers were looking to the future and designed a line of solid body electric guitars and basses that utilized some of the features that were developed for the the flat top instruments. 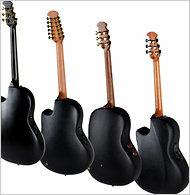 The company had imported some bodies from Hofner and added Ovation necks in the past to the Ovation electric guitars. 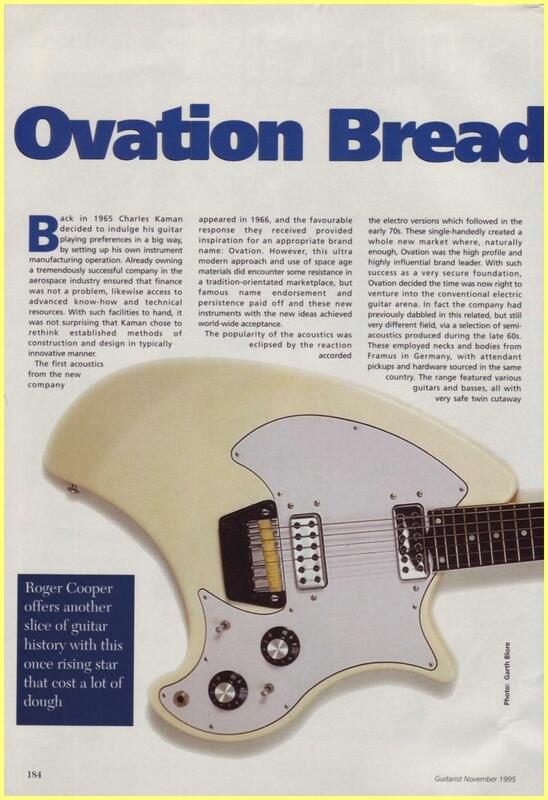 But the first two solid electric guitars Ovation created in house were called The Breadwinner and The Deacon. The designer of these instruments came up with a shape reminiscent of a battle axe. He states that he worked at Ovation/Kaman in 1971 and was a commercial artist in the advertising and public relations department. Because of his artistic background Ovation’s chief engineer suggested he come up with a couple of sketches of solid body guitars. The concept he came up with was the Breadwinner/Deacon body design. Shortly afterward Kaman had a plant wide layoff, so he left not knowing what had happened with his design. A few years later he was watching TV and saw David Cassidy playing a Breadwinner on a Partridge Family rerun. The totally blew him away. He was never at the plant long enough to see his design come to fruition. The deep cutaway on the lower bout was put there purposely to reach the high notes. The cutaway on the guitars end was an early ergonomic idea so the guitarist could rest the instrument on their thigh while playing, much like classical players. He suggested making the body hollow with a honeycomb structure for added strength, maintaining the traditional Ovation neck and headstock shape and using Lyrachord for the back. Ovation liked his design, but the honeycomb hollowed body was not feasible or cost effective. However they used the standard (for the time) Ovation neck and headstock and the Breadwinners solid mahogany body was coated in Lyrachord. This accounts for the fact that most 1972 Breadwinners still look like new. The Breadwinner neck was a two piece bolt-on affair made of Honduras bound mahogany topped with an ebony fretboard that had diamond-shaped dot inlays and 24 frets. 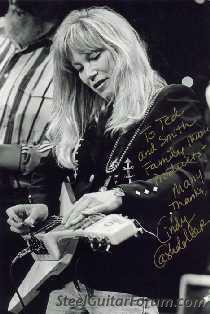 Initially the twin pickups were single coil models, although they were large and appear to be humbuckers. 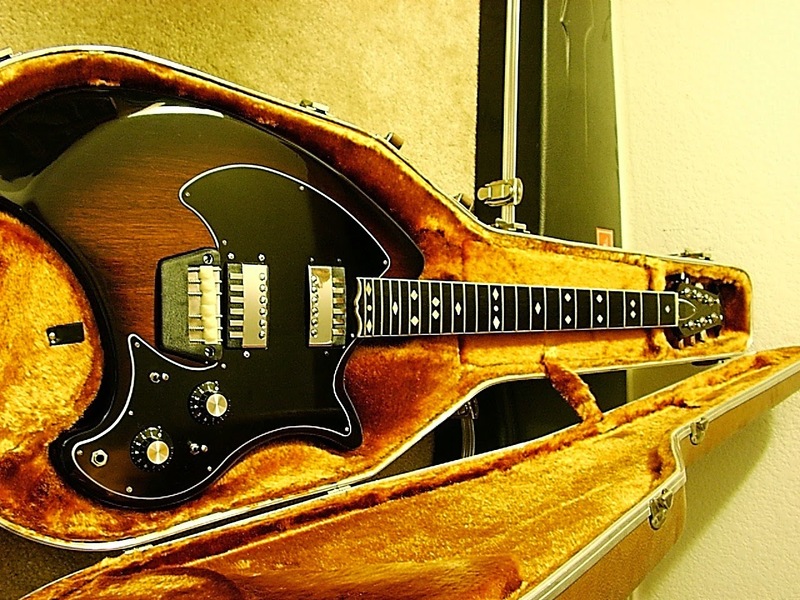 In 1975 this was modified to include 12 pole double coil pickups that resembled mini-humbuckers were introduced. These were advertised to be 20db quieter than humbuckers. The guitars bridge was made of brass. The bridge unit was adjustable in a way similar to a Stratocaster, however the individual saddles were made of nylon. The bridge unit was surrounded by a black textured nylon cover/hand rest. The embossed back plate for the electronics was very classy looking, as was the neckplate. As I have mentioned, the Breadwinners textured body was covered in Lyrachord and was available in black or white. From 1972 to 1976 grey, tan, red and blue were also an option. The instruments pickguards came in black, white, tortoise shell and paint swirl. The guitars electronics featured a the usual volume and tone controls, a 3-way selector throw switch and a band elimination switch that cut the midrange. The Breadwinner was THE first electric guitar equipped with active electronics. This was accomplished were provided by a FET (field effect transistor) preamp board in a pocket that was routed out of the guitars backside. This allowed the player to achieve a wide array of sounds. The preamp was powered by two 9 volt batteries. Behind the batteries on the preamp were 2 trim pots that adjusted the level of the preamp and phase switch. The pickup switching was very unusual. The first position, toward the neck, turned on the neck pickup. The second position turned on the bridge pickup. The third position, toward the bridge engaged the preamp. The Breadwinner was offered in 3 different models. The Breadwinner has already been described. The third model was an oddity known as the LTD. The LTD had all the features of the Deacon, but the body was shaped slightly differently. 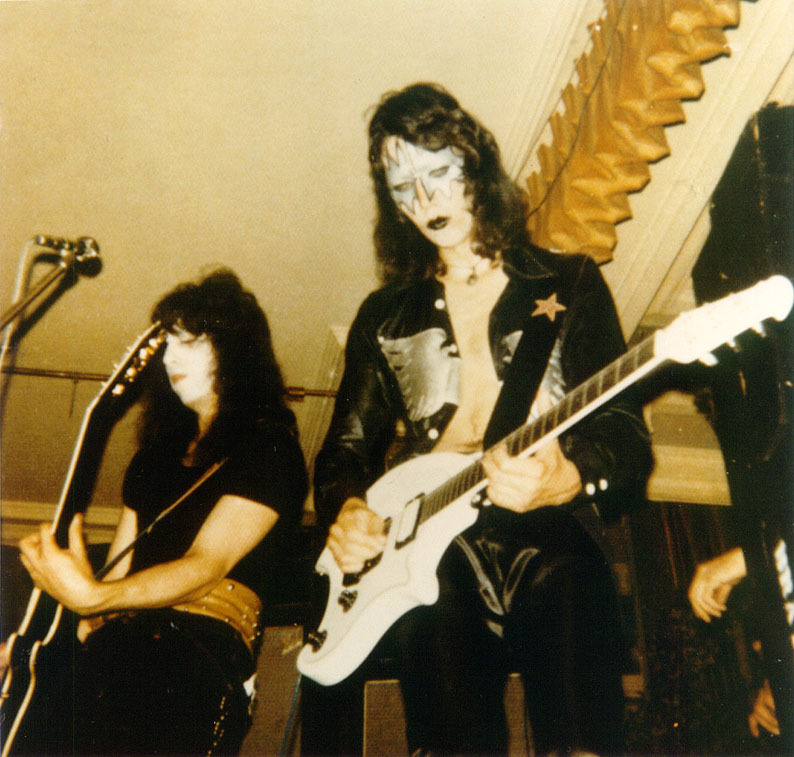 Ace Frehley of KISS played an Ovation Breadwinner. There are still a lot of owners that recognized the Breadwinner/Deacon as a great guitar. You will find no negative comments about this instrument. 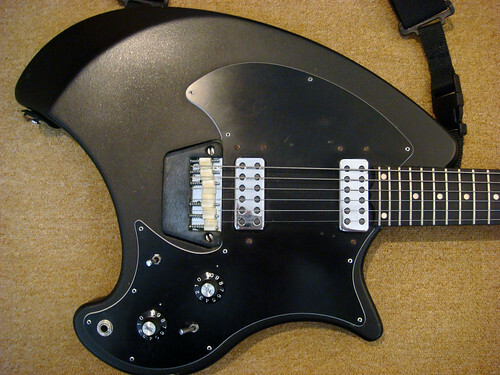 Possibly due to the odd body shape, Ovation had little success with electric guitars. When the Klein guitar came out, Ovation proposed to file a lawsuit for patent violation, but their lack of success with the Breadwinner line caused them to back off. The 1972 price guide for a Breadwinner listed it as $349 with hardshell case. The upscale Deacon was $449. These days they are selling for between $1500 and $2500. Although the Eastwood version looks very similar to the original, there are some discrepancies. The headstock is different than the Ovation headstock which make sense. The neck is made of one piece of maple instead of two-piece Honduras mahogany. The pickups are mini-humbuckers, which were different than Ovations double coil pickups. The guitars bridge is not enclosed by the Ovation covering and the saddles are not nylon. Instead of a FET preamp and phaser, this model comes with active pickups wired to a much simpler preamp circuit. The Eastwood model has a single volume and tone potentiometer as did the original and comes with a 3-way switch to control the pickups. A second switch turns the preamp on or off. The guitar can be played in the active or non-active mode. It is offered in White or Black and with a hard tail bridge or with a tremolo. The suggested price is $899. 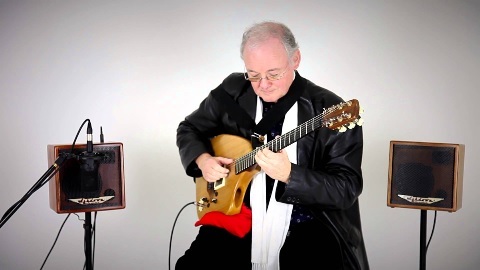 For those unaware of British finger style guitarist Adrian Legg, he is a remarkable solo player able to coax incredibly fantastic music from his guitars six strings, and although he is assisted by a bevy of effects, his skill is due to his talent. He was voted the best acoustic guitar player by Guitar Player Magazine for four years in a row. Adrian developed problems with his back that cause him pain while playing guitar in concert. To alleviate this problem he has gone to great lengths to have an ergonomic guitar created. He elicited this task to U.K. luthier Bill Puplett. The instruments unique design keeps him from having to bend over the guitars body while seated and keeps his back straight. Legg’s ergonomic instrument is reminiscent of the Klein guitar or Ovation Breadwinner; however it is more of an acoustic-electric style guitar, while the aforementioned are strictly electric instruments. The guitars body is made of two-piece swamp ash, with a cavity hollowed out before joining and then vented on the treble side cutaway. Legg states this flared soundhole helps with the out of phase coupling of the guitars sound chamber and opens out the high-end harmonics the instrument produces. The neck is made of two-piece black walnut with an ebony fingerboard. The acoustic bridge is made of walnut. The pick-ups are Graph Techs with a specially made Waffair Theene Dimarzio. The sweeping upper bout provides plenty of right hand support. The lower boat indentation helps support the guitar neck at the proper angle, since Legg always plays in a seated position. The chambered body provides some acoustic properties, but mainly reduces the instruments weight. The headstock is non-unique, except for the Scruggs style banjo. Bill Keith at the Beacon Banjo Company in Woodstock, NY, USA makes these. They allow Legg to change tunings quickly between or during songs. On the rear side of each tuner are two tiny thumb wheels that allow the tuner to be tuned and de-tuned to a fixed position. On the headstocks front side are six levers that pull the strings to a tighter or looser position. Since Legg is essentially a one-man show, he travels light with one guitar and a few pieces of electronic gear. 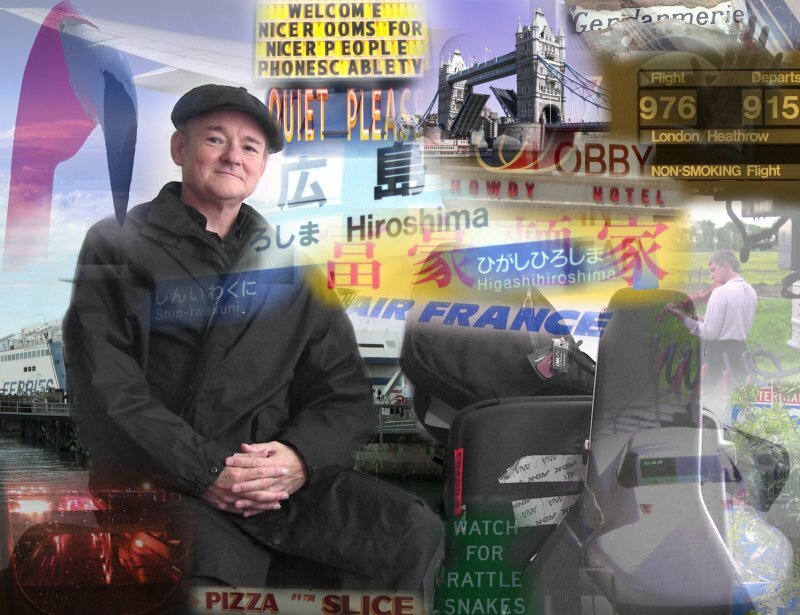 His Puplett guitar, which he calls, Bill, is small enough to travel in the overhead bin of a Boeing 777. As his guitar is not an acoustic guitar, Legg states this eliminates sound problems that amplification can cause with acoustic instruments. Legg playing is a mix an alternating-bass style with hamonics, banjo-peg retuning and single or double-string bending. 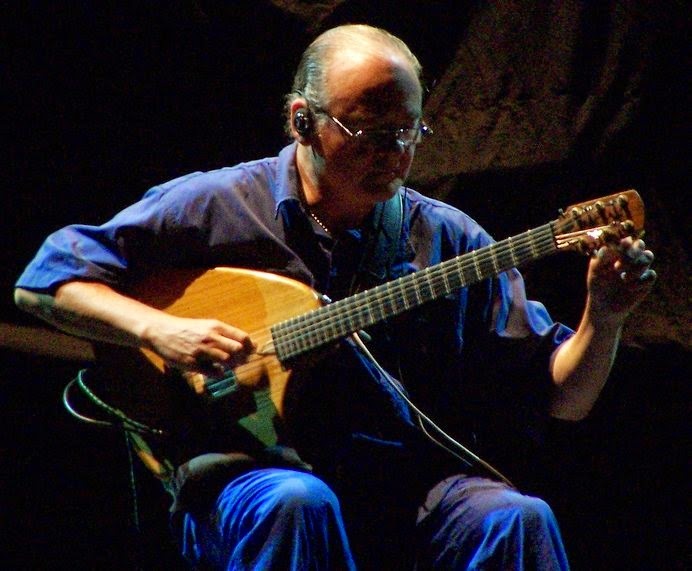 Often he will play a piece entirely in arpeggios similar to a classical guitar style. He makes extensive use of altered tunings and capos. The Keith tuners make this style easier for him. One of Legg’s favorite tunings is D-A-D-G-A-D. This is a tuning that is used extensively in Celtic music. Legg tells a story about playing at a Canadian folk festival. 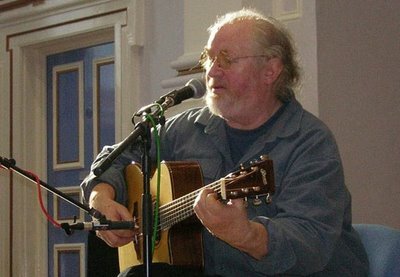 John Renbourn, a British folk guitarist that was also at the festival said that Davey Graham, another British folk musician had traveled to Morocco and hung out with some of the local Oud players. The only way he could play music with them was to tune his guitar to DADGAD. 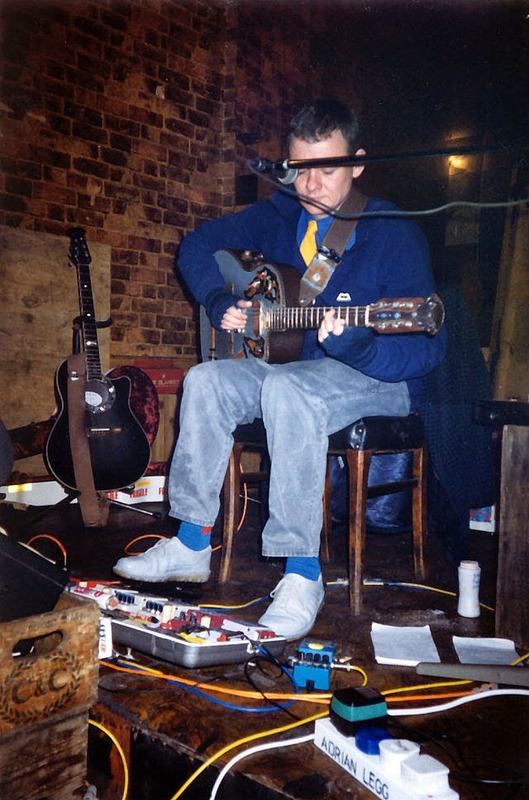 Graham brought this tuning back to the U.K. and influenced a number of British and American folk musicians, including Paul Simon, Martin Carthy, Bert Jansch and Jimmy Page. This tuning has been popular ever since. Legg’s current effects include a Roland VG-88 guitar synthesizer-controller coupled with a Roland GR-33 hex pickup and 2 Roland JV-1010 guitar synthesizer units. He prefers the JV-1010 sounds better than those within the VG-88. The VG-88 uses hex modeling instead of MIDI. This is important to Legg since MIDI converts the guitars sound to MIDI information to play the synth, while Hex models the guitars sound to create new sounds. For travel Legg had a velcro-topped board built that could break down in 3 sections to enable a setup that could be easily carried in a small package. 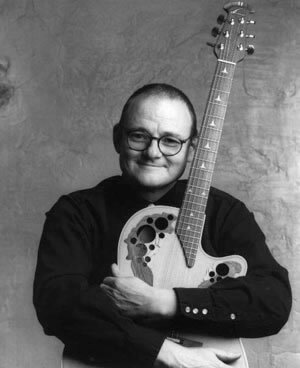 Early on in Adrian Legg’s career he was known for his relationship with Ovation Guitars. He extensively played a modified Ovation Adamas with a super-shallow body and extra light strings to assist in the steel guitar-like bends that are common in his songs. This guitar was also equipped with a set of Keith banjo tuners to accomodate Legg’s unusual tunings and string bends. The guitars saddle was equipped with the Ovation transducer that ran through the on-board Ovation Optima preamp and then to a Fishman parametric direct input equalizer. The Fishman allowed the guitar to change to low impedance, thus filtering out feedback. During that time frame Legg employed a Zoom 9000 unit for reverb and chorus and to split his signal from mono to stereo. The signals ran to a Trace Elliot TA-50 acoustic guitar amp (Ovation owned Trace Elliot at the time) for a stage monitor and then went to the house system. Although Legg has stated in the past how much he appreciated the Ovation connection, his chronic back problems have since worsened with age. Therefore it is difficult for him to play the Adamas in concert. Hence he relies on the Puplett guitar. 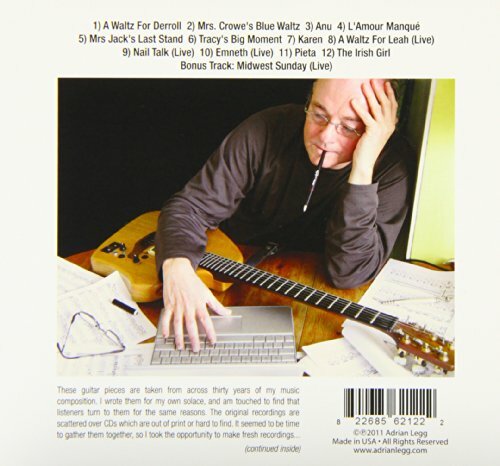 Adrian Legg is not only an incredible guitarist, but an author of numerous guitar books and manuals. 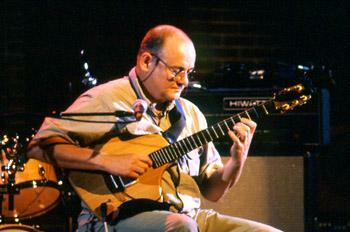 He has written columns for several guitar-based magazines. In the past he was a guitar/amp technician and designed passive circuits for Vox guitars and was involved in the design and prototype Trace Elliot Acoustic amplifiers. He was also an instructor at the Guitar Institute of Technology and has shared his playing with students on DVD’s and videos.